The Canon Pixma TS5051 is a combined printer, scanner and copier, integrated into a small and sleek unit. Smaller than its predecessors, it will complement the modern office environment and provides for most printing needs. With cloud connectivity and the ability to print from remote smart devices, functions can all be controlled from an easy-to-access LCD frontal panel with associated buttons. This is a printer for the internet age, making printing direct from social media child’s play. With dimensions of 14.6x12.4x4.9 inches and weighing in at 5.5kg, the Canon TS5051 is about half the size of previous models in the range and fits snugly into limited office space. With a copy speed of 6ppm and the ability to print colour and mono at 9 ipm and 12.6 ipm respectively, this is more than sufficient for most small office requirements. The unit is controlled manually from a 3-inch LCD panel at the front, with easy-to-access associated buttons to the left and right. Smart devices, such as tablets and phones, can be used to access cloud services such as Google Drive and print remotely direct to the machine, and there is a USB 2 slot for connecting additional devices. 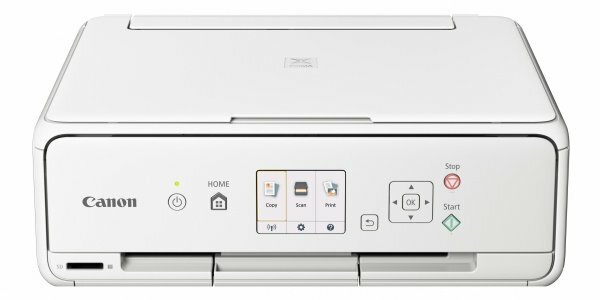 The Canon Pixma TS5051 has comprehensive capabilities for printing, scanning and copying, and is able to access social media as well as cloud services, making this the ideal multi-purpose printer for the modern networked office. The ability to separately change each of the five ink cartridges, and support for Canon’s 13cmx13cm glossy photo paper, are additional plus points, and the SD card slot means that you don’t need to connect the unit to a PC. The traditional oblong design of the Canon TS5051 may be a problem for some tastes, and the LCD screen needs to be viewed in decent lighting conditions for optimal clarity.